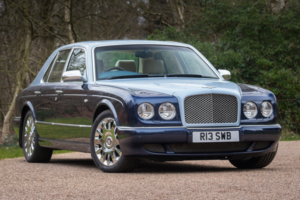 Classic car enthusiasts will have the chance to bid on a luxury 2004 Bentley Arnage R Mulliner Level ll at Classic Car Auctions’ upcoming June Sale taking place at the Warwickshire Exhibition Centre on 10th June. An example of Crewe’s finest craftsmanship, the sumptuous Bentley Arnage was the fastest and most powerful four-door saloon of its time, offering an extraordinary level of indulgent luxury and performance, and is now attainable at a fraction of the original price. This particular example, presented in Fountain Blue over Peacock Blue, started life as a press car at the Times Motor Showand has since been exceptionally well looked after, clocking up a modest 56,000 miles and remaining in stunning, like-new condition. Finished to a very high specification and featuring a sublime Mulliner Level II interior, the car is upholstered with Cotswold leather with French Navy leather dash, walnut picnic tables, wooden steering wheel, French Navy carpets and walnut and chrome detailing. Other mod-cons include an electric rear blind and fridge in the back. Not only that, the car offers plenty of power with a 6.75-litre Rolls-Royce V8 with two Garrett T3 turbochargers, capable of producing a thrilling 399 horse power. Costing £147,000 when new, bidders at the auction could take home this extraordinary vehicle for a quarter of the original sale price at an estimate of £30,000 to £40,000. “Bentley is the epitome of luxury and this is car is just stunning, stunning, stunning”, explains classic car specialist Joe Watts, classic car consignor, Classic Car Auctions. “The sheer class of this Crewe original is breath-taking and the condition of the car is difficult to fault. Anyone looking for extreme luxury at a very attractive price should definitely come along on auction day.” Prospective buyers are invited to attend CCA’s June Sale dedicated viewing afternoon at the auction venue on Friday 9th June where they can also register to bid whether in person, by phone or online.